The well-known comedian who once wondered what dogs did on their day off because lying around was their job must not have known the modern day wonder that is the service dog—and how hard they work every single day to bring comfort and independence to people who have a disability. their respective challenges as neither of them want to let each other (or their families) down. RESCUE & JESSICA is an important read; a challenging but captivating book for young readers. 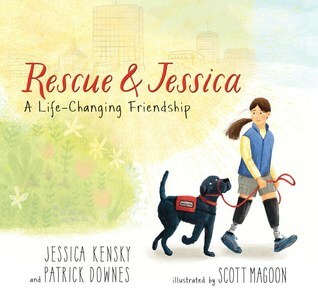 Kids will find a relatable peer in Jessica despite her exceptional challenges and they will be charmed by Rescue’s capabilities: answering the phone, opening doors and barking for help, among many others. In as much as it is about rebuilding her life, Jessica’s story is also one of resilience and of the indomitable inner strength she exerts to begin to overcome her traumatic experience. I am a Boston Marathon bombing survivor and I learned firsthand about that strength. 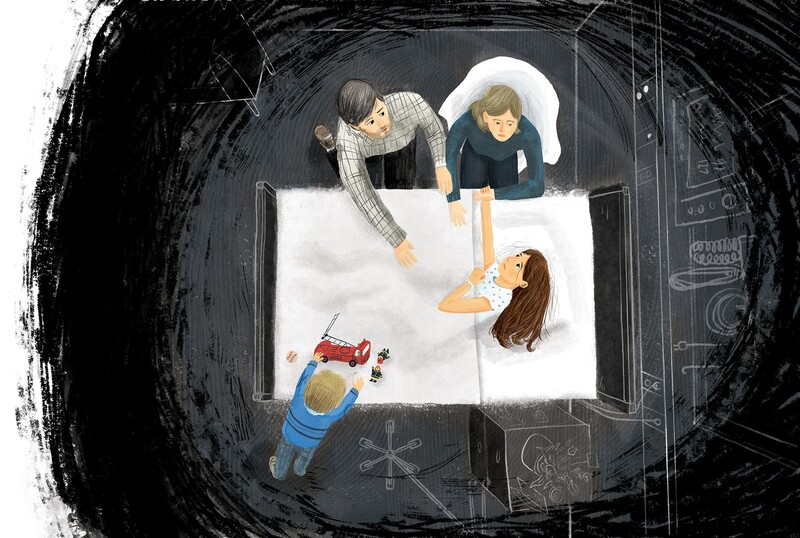 Unlike the authors who lost their lower legs to the first explosion, my family and I escaped physical injury but I would learn that there can still be deep psychological scars to overcome. There is a real, difficult and sustained effort in fighting those demons. That is a battle many people wage every day, in both big and small ways. Not only does this book hope to demystify life lived with a disability, it aspires to spark discussions about what life may be like for a person who has lost limbs—either through an accident, an attack, or even disease. This book is, on both grand and personal scales, a story that relates to all of our lives and all of our struggles: how we stay strong. I was out to make a book for all readers; both young and old from the beginning. My mission was to have young readers absorb the story about Jessica and Rescue as they began their lives together while older readers would discover subtler and more nuanced storytelling and meaning in my art. Hopefully the end result is a richer experience for everyone. To achieve this, I used one of the oldest tricks in the book. I used symbolism in the art. Dan Brown’s Robert Langdon would crack these in no time, but here are a few examples of how I tried to elevate meaning in RESCUE AND JESSICA. Emerson wrote that only when it’s dark do you see the stars. After her second amputation Jessica lies in the dark of her hospital room, cuddling in her bed with Rescue. In this darkness behind them we see the stars in which the Canis Major constellation appears with Sirius—or Dog Star—being the brightest. At night, it is visible from any point of Earth and it has been used as a point of navigation for thousands of years. 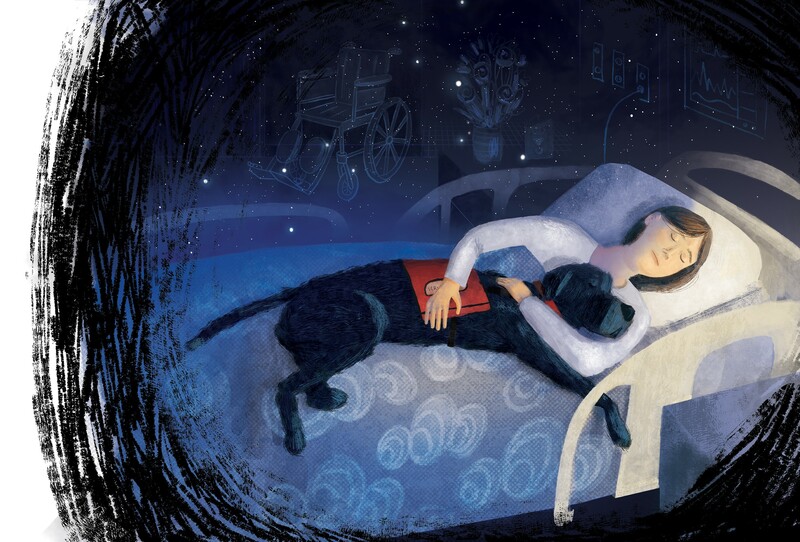 Like Sirius guiding travelers, RESCUE & JESSICA dog stars Currahee & Rescue show Jessica—in the night, or darkest times of her recovery–a way to a better life with and beyond her disabilities. That fills her and the reader with hope: as she lay in her hospital bed feeling lost and uncertain about what lay ahead it’s her dog that will guide her home. 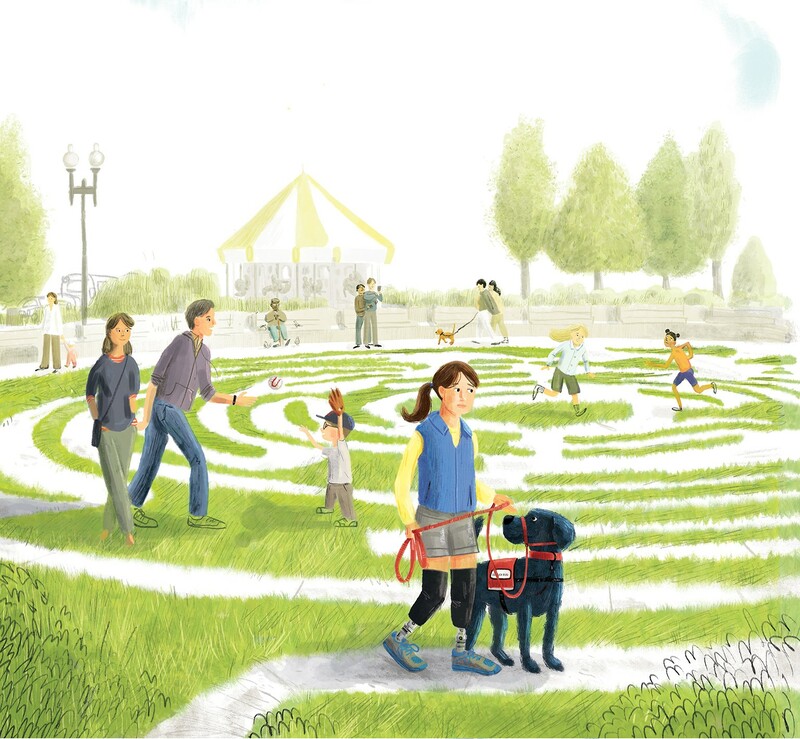 Later in the book, as Rescue and Jessica begin their recovery back from Jessica’s second amputation and she starts over, I show them walking through of the Rose Fitzgerald Kennedy Greenway maze in Boston. I’ve used the maze as a symbol of how they must find their way through their difficult experience as Rose Kennedy did during her most trying days as she mourned the losses of her children. Also present in this scene—other kids around Jessica’s age at play as well as other Bostonians enjoying their day in the sunlit park, oblivious to what Rescue and Jessica have been through and are struggling with. This is a dynamic I wanted to capture from how I felt in returning to the site of the bombing on Boylston Street. In the days, weeks and months after the bombing, I was struck at how life returned to normal there. “Don’t you know what happened here?” I wanted to yell to everyone. “How can you all just go back to normal here in this spot where such atrocities happened?” Yet, on another level, in my heart I knew this hustle and bustle and return to normal was healthy and good. And in those moments of disconnect, I knew I was in that figurative maze and had awhile before I came out. At the end of the book we see Rescue, Jessica and her family upon the Boston Public Garden footbridge, crossing from out of the clouds and into the sunlight. It is meant to convey their leaving darker days towards a brighter future. As a symbol it’s noticeable. Any lingering concerns I had about readers missing it were allayed last week when a fifth grader at a school visit raised his hand and announced it out of nowhere, unprovoked. Symbolism is not lost on children. The bridge has even further symbolism. When worn by amputees, prosthetics serve as a bridge—for Jessica they span a gap between her body and the ground. In tying the structure of the bridge to the story, it reminds me that we bridge our own shortcomings or gaps to cover divides we might not ordinarily be able to cross. In one way or another, we are all reliant on some kind of support, whether we have four legs, two legs or no legs. Incidentally, the bridge connected the authors, Jessica and Patrick, and me figuratively. Although I didn’t know this at the time I was illustrating the book, Patrick proposed marriage to Jessica on that bridge—and they crossed that bridge on their way to watch the marathon that fateful day. Not every book I’ve done in the past affords me this level of storytelling. Nor should it—some books are just straight up fun and for laughs. But when a book seeks to demystify and remove barriers from our eyes, that goal can seem overwhelming, especially when the intended audience is of a tender age. Symbolism in picture book art can reveal itself to readers with time and maturity, as they become more sophisticated. In so doing, symbolism opens the story to multiple levels of readers. In many ways, books are the bridge, ferrying us from one part of our lives to another, with our dog star leading us through the maze. Scott Magoon has been designing, writing, and illustrating books for young readers since 2003. He lives in Reading, Massachusetts with his wife and two sons. Visit him online at http://www.scottmagoon.com/. Thanks so much for sharing about the process of creating this beautiful book! Books are absolutely bridges which develop empathy in readers. The children and adults who read RESCUE & JESSICA will be blessed by your artistic creativity!